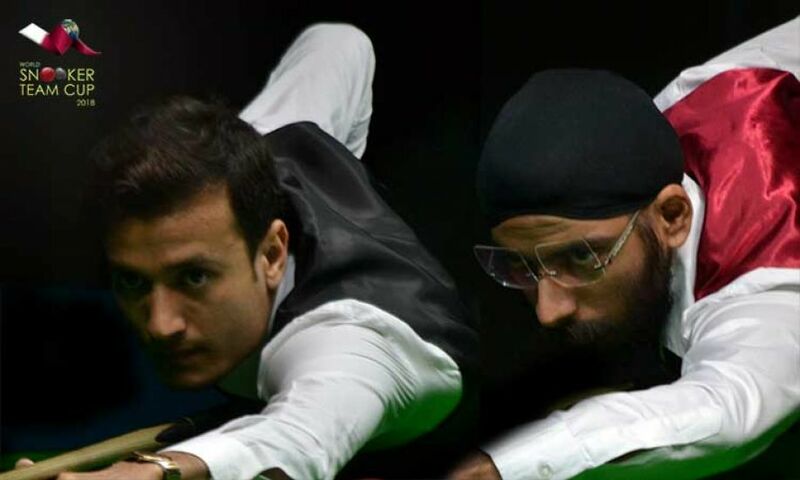 Team India-1 (Shahbaaz Khan / Malkeet Singh) registered first win for the inaugural edition of World Snooker Team Cup 2018 here at Doha, Qatar. They beat team Iceland 3-0 in the opening match of the day-1. In the first frame, Malkeet Singh took on Gunnar Hreidarsson and succeeded to win that having decent victory margin (73-12). His partner, Shabaaz Adil Khan, in second frame, crafted the first century break (109) of the competition to raise the lead to 2-nil. Being in comfort zone, both of them complimented each other in doubles frame too to score 56-17 and won the match 3-0. Meanwhile, team Iran of Amir Sarkhosh and Ehsan Heydari Nezhad surprised Welshmen Andrew Pagett / Alex Taubman by defeating 3-1. Despite trailing, Andrew made a good comeback in the first frame but before he could seal the frame, the brown ball railed over the cushion after hitting the jaw of green pocket. That chance Amir capitalized with his clearance of 22 points to take initial lead. The second frame was easy for his partner Ehsan Heydari Nezhad, which he wrapped up by scoring 67-11. Though the Welshmen managed to secure the doubles frame (87-07) but Ehsan countered Andrew very well in the fourth frame to register 3-1 victory.